Trading each team’s pin has become a celebrated tradition for participants. As each state prepares to send athletes and supporters, they design a trading pin. These pins are intended to be traded with other teams with the goal of receiving all 58 team pins! Athletes end up sharing their transplant story with each one traded. Arizona’s pin was designed by Steve Woodward, friend of liver recipient and athlete, Steve Whitehead. Join us as we support organ donors, donor families and transplant recipients at this amazing event and see if you can find all 58 pins! And it continues like that until we have our winner. Can someone donate their airline or car rental points to an athlete? The answer is YES! We registered an account with Southwest Airlines, Enterprise Car Rental and Hilton. It is so easy to transfer points to the Team account. Then we use your donated points to purchase airline tickets or rental a car to travel to Salt Lake City! Call 602-277-2661 or email info@transplantteamaz.org for more information. Read about one of our youngest athletes, Daisy. Do spectators need to register for the Transplant Games? The Transplant Games offer a large number of multi-faceted events. Most of the events and activities are open to the public (non-registered attendees) but there are some that are “additional fee” special events for which even registered guests must purchase tickets, and then there are events that are free but require tickets to gain entry (used for events with limited seating). Registering will also ensure transportation to and from events. If not registered they will have to schedule their own transportation needs. Opening Ceremonies – Free entry to opening ceremonies seating. Tickets are required. National teams and supporters who march into the stadium, or otherwise participate in the programming are required to be registered and credentialed attendees. If not registered, they cannot march in with team and will not be allowed to sit in team seating. There will be public seating for non-registered attendees. Below is a breakout what registration gets you and where tickets are required. Competitions – Free entry for all spectators at all competitions. No ticket required. Workshops/Seminars – Available only to registered attendees. Credentials required/Must be registered. Welcome Reception – Available only to registered attendees. Credentials required/Must be registered. Quarter Century Club Dinner – Additional Fee Special Event. Tickets are required. Tickets are only available through registration. Donor-Recipient Bowling – Additional Fee Special Event. Tickets are required. Tickets are only available through registration. 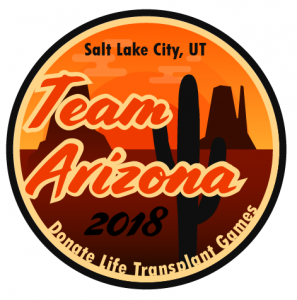 PHOENIX – While many watch the 2018 Winter Olympics Games, another group of champions in the Valley is training for a unique competition—the Donate Life Transplant Games of America. On Feb. 24, 2018, Transplant Team Arizona will be a part of the Transplant Games flag tour at the Encanto Park Sports Complex at 12:00 p.m. Athletes will train in different sports and sign the flag to mark their participation in the competition which is a tribute to how organ donation has shaped their lives. This year Randy Shepherd, 43, will compete for first time. He says the person who donated their heart to him will be on his mind the whole time. “I’ve always got a little prayer of gratitude in the back of my head for everything I do,” Shepherd says about his donor more than three years after getting his gift of life. The married father of three was on the waiting list for six years—with congestive heart failure, and an artificial heart by 2014. Now, he hikes, he rides bikes, he plays baseball and basketball. On tough days, his wife encourages him by saying, “Isn’t it awesome to be this exhausted?” It’s a reminder that, at one point, he couldn’t even walk himself to the bathroom. Twenty-five Arizona athletes will compete in the Transplant Games of America in Salt Lake City. The Donate Life Transplant Games is a multi-sport festival event for people who have received lifesaving organ, tissue and bone marrow transplants or for living donors. It highlights the importance of organ, eye, and tissue donation. More information can be found at www.transplantgamesofamerica.org. Arizonans can sign up as donors when they apply for or renew their driver’s license or ID at the MVD. They can also register online at DonateLifeAZ.org or by calling 1-800-94-DONOR. Click here for photos of the Flag Signing Event in February 2018. If you are unfamiliar with the Games, read about the guidelines for participation on their website. The games are a multi-sport festival event to help promote the need for Organ & Tissue donation. The purpose is to show the world that transplantation is a treatment that does indeed work. As a participant, you get to show the world that having a transplant is a second chance at life. You must become a member of Transplant Team of Arizona to compete. Go to http://www.transplantteamaz.org/membership-page/ to apply for membership. Always check the Transplant Games’ website http://www.transplantgamesofamerica.org for updated information on qualifications, registration, and more! You can also find results and photos from 2016 and 2017. Click here for Transplant Team Arizona membership!